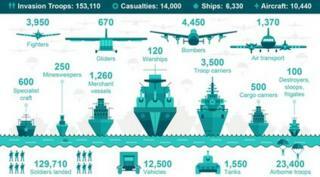 What was D-Day and why is it important? It was a seaborne invasion, the biggest one in history. It's a key date in the story of the Second World War. The whole operation was codenamed Overlord. It happened on 6 June 1944 after five years of war with Germany. A massive military force set out from the UK towards France. It was going to overthrow Nazi Germany and its leader Adolf Hitler. The Nazis had taken over nearly the whole of Europe. The Allied forces landed on the beaches of Normandy and started to break through the German army's defences. They began an attack that lasted for eleven months and took them all the way to the German capital Berlin, to the bunker that was Adolf Hitler's headquarters. 1. The attack began when Allied planes and warships bombarded German positions along the coastline. This was to damage the defences making it easier for the troops to get ashore. 2. At the same time planes and gliders dropped tens of thousands of allied soldiers behind the German defences. They took control of important roads and bridges. This made it harder for the German army to rush extra men towards areas where the troops were landing. 3. Thousands of ships set out from the south coast of England, in all over 6,000 vessels joined the attack. They were supported by over 11,000 planes. The naval force crossed the channel overnight. 4. 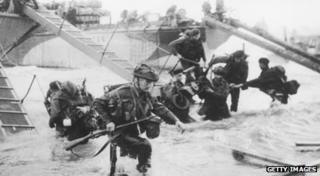 At 6.30am on 6 June troops started to land on the beaches of Normandy. 5. 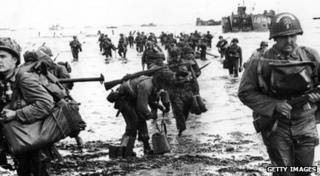 By the end of D-Day the Allies had put 156,000 troops ashore. Portsmouth's D-Day Museum says an estimated 2,500 Allied troops died on the day of the invasion. 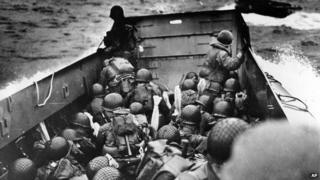 The Allied troops landed on beaches along an 80km stretch of the Normandy coastline, in the north of France. It's not the nearest part of France to the UK. It was chosen because Hitler was expecting the invasion force to cross the English channel at its narrowest point. By making a longer sea voyage they avoided some of the heaviest coastal defences. The towns may have French names, but the five Allied landing beaches are still known as Utah, Omaha, Juno, Gold and Sword. Which Allied nations took part in the fighting? The majority of troops who landed on the D-Day beaches were from the United Kingdom, Canada and the US. The 'D' in D-Day does not stand for anything, it's a just a name the military use when planning an event. The military started planning the details of the invasion before they knew the date when it would take place. In order to organise things like when the troop ships should leave England they referred to it as D-Day. The name D-Day has been used for many military operations, but it is now firmly associated with the Allied invasion of Normandy.